Colorblind Fix 3 is an excellent platformer by King Bowser, combining action and puzzle elements from the Mario series, Metanet Software's N, and Helix Games' Jumper to name a few. Of course, having so many influences does not necessarily mean that the end product will be any good. Fortunately in this case, everything works well to draw you in and keep you addicted to it for a long time. 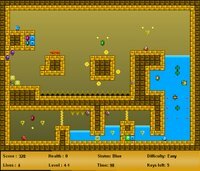 Featuring a hundred levels, it's quite surprising that every stage still manages to offer a different challenge, whether it requires quick thinking or extraordinary reflexes. 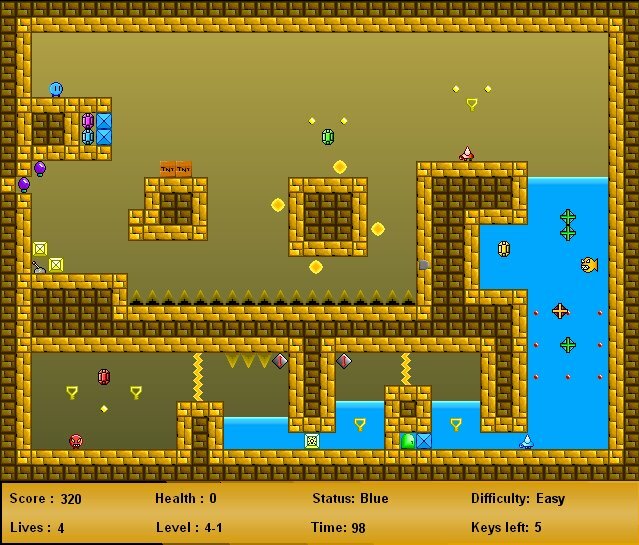 The objective in each stage is to collect all keys and reach the exit. One minor drawback is that the game tends to run pretty slow on older machines. The help screen does not work at all, and your progress is only saved after every tenth level. Instruction on activating the debug mode can be found in the forum, solving at least one of the issues mentioned here.